Organize a costume parade for kids. 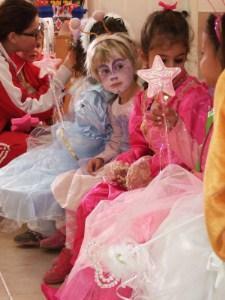 For kids in kindergarten, Halloween party ideas need to be short and active to keep them occupied throughout the party. Whether it is at home or at school, the five and six year olds will enjoy doing activities, crafts and games for the Halloween holiday. Upon arrival, many youngsters will have plenty of energy, making it the perfect time to play some Halloween party games and activities. Games with simple rules work best for kindergartners and make it easy on the adult host. Classic games with a Halloween twist are perfect for this age group, as they will already be familiar with the rules of play. Ghost Ghost Witch: Play this instead of Duck Duck Goose. Hide the Pumpkin: Hide a plastic pumpkin in the party area and split children into teams to search for it. Pin the Hat on the Witch: Hang up a poster of a witch and have kids try to pin on her hat. Capture the Bat: Give teams a small stuffed or paper black bat. Divide them into two teams and have them try to capture the bat from the other team. A costume parade is a fun kids' Halloween party idea for kindergartners. Make sure to let everyone know that the party is a costume party in the Halloween party invitation. Once everyone arrives, line them up and march around the party area or even around the block. Consider bringing along a portable boom box that plays a mix of scary Halloween music for the kids. Halloween party entertainment does not have to involve just games. Consider hiring an entertainer, similar to a birthday party entertainer, to keep kids busy during the party. A face painter or balloon artist could set up a station in one area of the party. Another entertainment idea is to ask a natural resources expert to visit with the kids about bats and other creepy-crawlies. He or she might bring small insects for kids to see, give out information or even read a few books. While you don't necessarily need a full Halloween party menu for a kindergarten party, you still need to provide refreshments. Children enjoy helping prepare foods, so consider getting them involved in making up some of the party desserts. If you have several adults, set up a few tables with all the fixings for a Halloween dirt cake. Let the adults mix the pudding and put the initial cake together and then allow each group of kids to decorate their cake as they wish. In fact, parents and helpers could even judge the scariest cake decorations before the kids eat. Decorating cookies is always a big hit at any children's party. Set out cut-out cookies shaped like hats, cats, bats, witches and monster heads along with decorations. Allow kids to make up their own decorations. Provide small Halloween bags for children to put their cookies inside, allowing the cookies to double as their party favors. Keep kindergartners busy with craft ideas for the holiday. Be sure to check out the supplies needed for each craft to make sure you have plenty for all the kids. Kindergartners make frequent mistakes, so planning to have extra supplies for Halloween crafts is a good idea. Keep in mind that some crafts might require adult help or supervision, so be sure to have approximately one adult per five children to help out with making the Halloween crafts. A simple craft is to paint silly and scary faces on miniature pumpkins. Painting faces on pumpkins is safer and easier than carving pumpkins for kindergartners. All you need for this activity is enough pumpkins so that each child gets one, paints and paint brushes. Be sure to have newspaper, paper towels and wipes on hand. This cute craft can be fun for kindergartners and will give them a lasting memento from their class. You can purchase premade foam frames or use ones cut out from cardstock. Have decorations such as glitter, cut out pumpkins, ghosts and bats for the kids to glue on their frame. They can then put a photo of themselves from trick or treating in the frame. Another fun craft for kids is to make a trick or treat bag. Kids can decorate paper grocery bags with their own designs. Have stickers, markers, glitter, Halloween cut-outs available for the kids and allow them to use their creativity to come up with their own one-of-a-kind designs. Another version of this craft is to cut out a jack o'lantern face for each bag then line the bag with vellum so the candy won't fall out. This craft is simple to do and can make for a cute decoration. Have kids cut out pumpkin faces from orange construction paper then glue each design onto a clear glass jar. A candle can be placed into each jar and then lit for Halloween. When planning a party for young children, it is best to have several kindergarten Halloween party ideas. Kids at this age often move quickly from one thing to the next, so it is better to be over-prepared than under-prepared.